Executive Clemency for Leonard Peltier, global indigenous spiritual leader and US political prisoner serving over 40 years in prison as an innocent man falsely convicted on fabricated evidence so the FBI could “save face”. Recognize the Truth is a real thing and not a made up thing! To foster an uprising of human consciousness to a higher level from which the solutions to problems can be seen, towards bringing the human mind into harmony with the Natural World Order, a Scientific Spiritual Revolution of Consciousness fostering Trust in Divine Love. 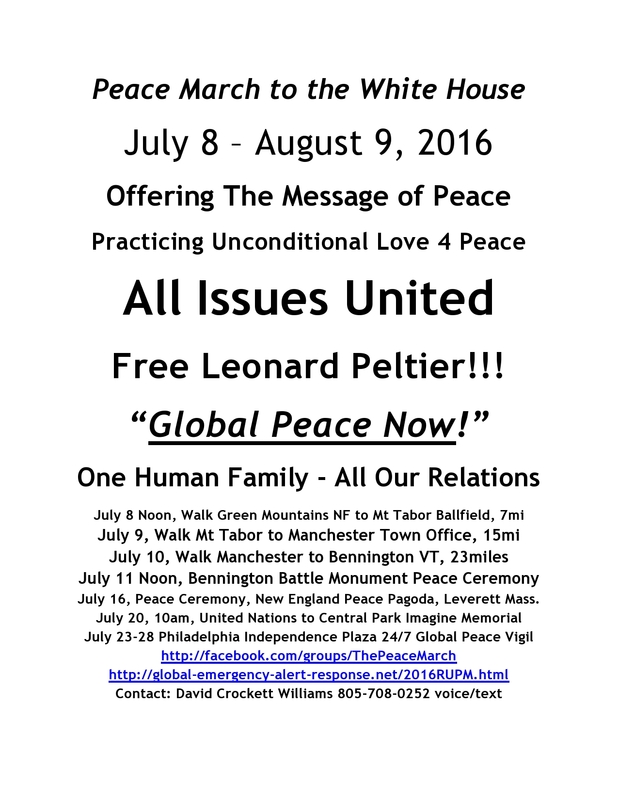 We will be adding a growing list of issues to be championed by the walk, including Presidential Clemency for Leonard Peltier, global health, environment, peace, and energy solutions, proposing implementation of the traditional Hopi interpreter Thomas Banyacya's vision of a Spiritual Peoples United Nations, One United Nation for The Great Earth Peace. June 20 - Summer Solstice, annual World Peace and Prayer Day initiated by Chief Arvol Looking Horse for consecration of sacred sites all around the world, World Peace Prayer Ceremony at Main Meadow site where Rainbow Gathering is waiting to set up or is setting up the main gathering site on US public land, sacred lands to the local indigenous people who are invited to offer their welcoming and prayers. Full Moon evening. Setup of Rainbow Uprising Global Peace Zone Camp during week of June 24-30 at the 2016 annual Rainbow Family Gathering site. F-Sa July 1 & 2 – Rainbow Uprising Team Networking with the various camps at the Rainbow Gathering, readings of the Hopi Declaration of Peace, the Hopi Message and Invitation to the World Spiritual Leaders, Explanation of the Rainbow Uprising of Consciousness Symbol of The Message of Peace, the schedule details of the Rainbow Uprising Peace March to the White House departing from the gathering on July8 ending at Lafayette Park at the White House Aug9, and other important information carried through the camps regularly by runners and radio. Mon July 4 - Noon-1pm, Annual Silent Hour Global Peace Prayer Circle of Hands Ceremony, usually 10,000+ human family relatives, morning silent meditation/prayer throughout the camps, no peace pole presence, focusing intent on the emptiness inside the circle representing the void from which all blessings flow, the zero point. Tue July 5 - Peace Pole Council, Rainbow Uprising Camp Circle, planning for viral spread of rainbow uprising peace poles and related ceremonies in communities around the globe to share their symbolized message of peace as a “rainbow road-sign on the information highway” that points the way to peace through the practice of unconditional love. Thu July 7 – Rainbow Family Vision Council, includes discussion and decision on where the 2017 annual gathering will be held, possibly same site as 1977 near Truth or Consequences New Mexico. 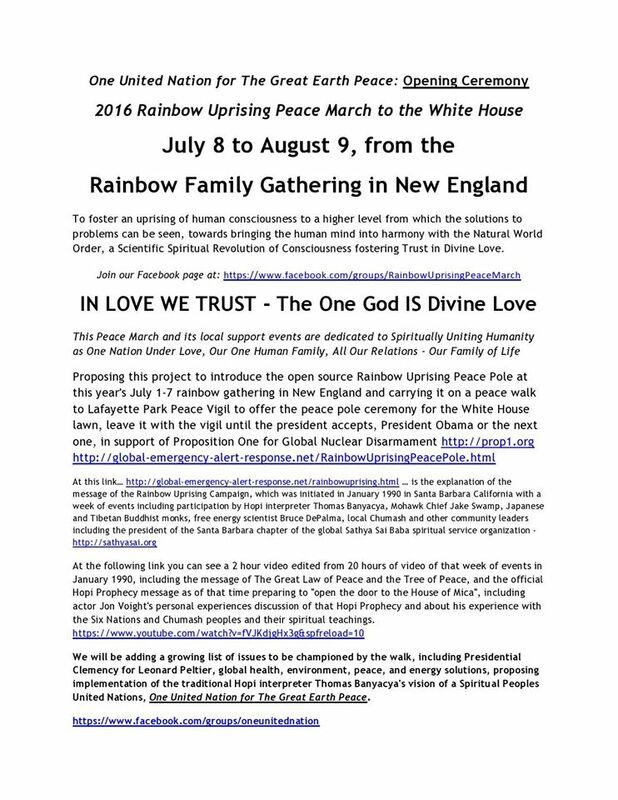 Fri July 8 - Noon Rainbow Uprising Peace March departs walking from the 2016 July1-7 Annual Rainbow Gathering site, and running as a “Global Peace Relay” as needed to cover daily distances, first day ends at Mount Tabor town baseball field bus parking area, about 6 miles, 2hrs walking. Sat July 23 – Noon Arrive Philadelphia, set up Rainbow Uprising White House Peace Pole 24/7 Vigil in Independence Square, inviting all Presidential Candidates to come and receive and discuss and embrace the Message of Peace it symbolizes. Tue Aug 9 – Nagasaki Day, Walk Malcolm X Park to Lafayette Park by White House, begin 24/7 Peace Pole Vigil Prayer until Leonard Peltier receives Presidential Executive Clemency so he can be in the circle with the president to install the Rainbow Uprising Peace Pole symbol of the Message of Peace in the White House lawn. 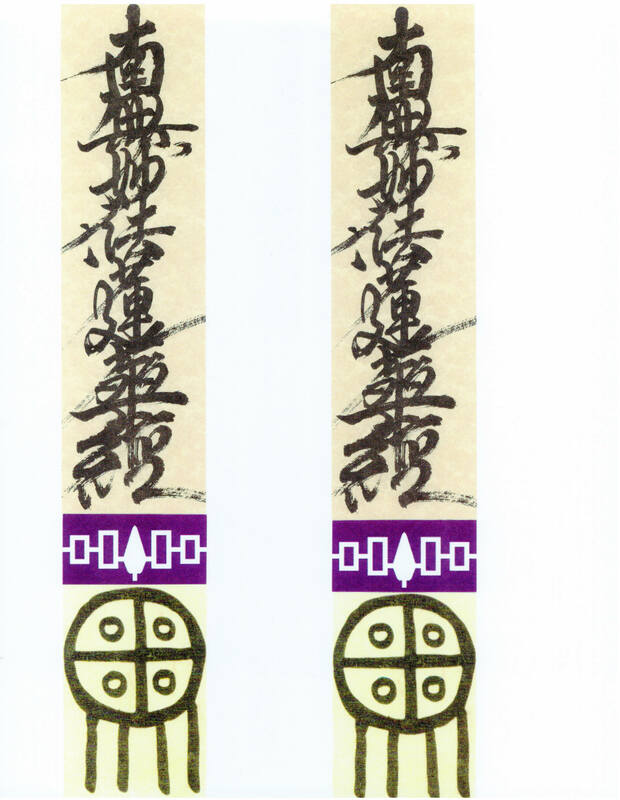 Mon Aug 15 – Presentation of Global Peace Treaty and Rainbow Uprising Peace Pole Ceremony for President Obama, the 71st Anniversary of the Japanese surrender that ended WWII after the atomic bombing of Hiroshima and Nagasaki August 6th and 9th, 1945. Offer Rainbow Uprising Global Peace Treaty created between now and then, based on universal acceptance of the Hopi Declaration of Peace. August 20, 2016, 22nd anniversary of the 1994 birth of the White Buffalo calf named Miracle in apparent fulfillment of the Lakota Prophecy of Hope for these troubled times predicted nineteen generations ago. 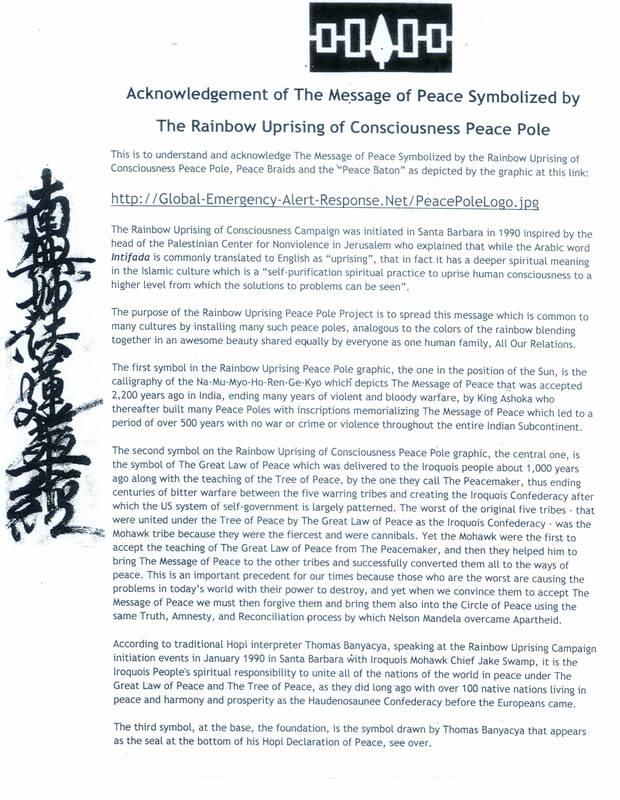 October 24-31, 2017, A Forum for Global Peace at the Santa Fe Convention Center, defining the state of peace we seek to help the United Nations fulfill its Charter’s global peace mandate, a Rainbow Uprising of Consciousness Campaign production initiated by the Global Peace Walk project of the Turtle Compassion Foundation.